“An Inside Look at Newman Part IX” by Jack Topping. On October 11th, 2017, the Numismatic Guaranty Corporation (NGC) announced that the certification of more than 400 coins was complete in preparation for Part IX of the Eric P. Newman collection auction on November 1-3, 2017. This remarkable collection, including Colonial American period coins, territorial gold, fractional gold, and more, will be sold directly by Heritage Auctions. The feature of the auction is an 1861 Confederate States of America half dollar, minted in New Orleans, Louisiana. Occupied by the Confederates during the American Civil War, this Union mint became an important part of the very short lived Confederate economy. Although only four of these Confederate half dollars were minted, bullion coins, other Confederate coins, as well as regular Seated Liberty half dollars were minted during the Confederate occupation. However, no major minting of Confederate half dollars ever occurred there, even though the Confederates did continue to keep the mint operational from “April 1 until the bullion ran out later that month”, as the Union liberated the mint nearly a year later in 1862 (Lambousy 42). As Newman’s collection will be auctioned and distributed to different collectors throughout the world, the proceeds will stay within the numismatic community, according to Eric Bradley, Director of Public Relations at Heritage Auctions. It is truly remarkable how this one specific auction affects the numismatic community as a whole. Unlike other auctions, this one is especially unique, due to the history and legacy of a top numismatist attached with each individual coin or paper currency note. The community as a whole looks forward to how the Eric P. Newman Part IX collection will affect both present day numismatists, but future numismatists inspired by the legacy of Mr. Eric P. Newman, especially because of this auction. Special thanks to the Heritage Auctions team, Mr. Eric Bradley, Mr. Mark Borckardt, and Ms. Maureen Levine for contributing. NGC Certifies Eric P. Newman Part IX. Numismatic Guaranty Corporation, 11 Oct. 2017. http://www.ngccoin.com/news/article/6176/newman-part-ix/. “JET Numismatics Published in Coin World” by Jack Topping. After reaching out to Coin World and speaking with Editor William Gibbs, I received great news in regards to my goal of becoming a published author in a well known, well respected numismatic publication. Mr. Gibbs had graciously given me the opportunity to write a guest commentary for Coin World’s March 27th issue. Immediately after I accepted his offer, I got right to work drafting a topic I was invested in: numismatic art. As I wrote in the guest commentary, “At what point does ‘art,’ something truly subjective, cross the line into desecration of old or valuable coins?” I expressed my opinion throughout the article, referencing previous research I had completed on the topic, and came to various conclusions, all of which thankfully met the standards of Mr. Gibbs and the Coin World staff. Overall, I am honored and excited to have been a part of Coin World’s issue and I hope to write for them again sometime in the future. You can find Jack’s article, “Numismatic Jewelry: Is it a Form of Self Expression or Coin Mutilation?” on Page 14 of Coin World’s March 27th Weekly issue, as seen here. “A Different Lens: Numismatic Photography” by Jack Topping. It’s almost two weeks into the New Year, and many people are still enjoying the last final parts of the holiday season. With the New Year comes new things: new holiday gifts, new memories, and this year, a new President (in the United States). While many enjoy the “new” things in life, classic traits to numismatic photography remain the same. I use the same camera (Sony DSLR), same techniques, and same simple tricks to get an interesting depth of field, interesting angles, and overall, an interesting picture. While I am in no way a professional photographer, I do want to share two interesting finds over the past year of tinkering with my coins, my camera, and my free time. The most interesting technique I learned of is using a magnifying glass on a regular camera with a “point-and-shoot” lens. This gives the resulting image a type of fish-eye look, a unique distortion, and impressive magnification on very finite details of every coin. There is truly no way to explain the effect through words. The strange, but beautiful distortion is something that needs to be observed in person. The second interesting piece of information I discovered is intense lighting. When taking photographs, one can use studio type lighting, with light boxes, overhead lamps, and other expensive materials for a truly impressive look (i.e. the “catalogue” type images used for professional companies like NGC, PCGS, and others) however not everyone can afford that type of setup, myself included. The other option is using what is available to your advantage. For example, when I was taking a picture of a proof American Silver Eagle from 1989 (pictured above), I placed the coin directly under a lamp with a regular lightbulb, one that had a slight yellow/gold hue. What this did, especially with the cleanliness, shininess, and perfection of a proof coin, made the coin in the image appear gold. Clearly an American Silver Eagle does not contain any gold whatsoever, the lighting alone confused many friends who weren’t familiar with U.S. coins. In conclusion, it is worthy to experiment with numismatic photography. You will find that it is a meaningful experience, and you will almost always learn and see something new every photo shoot. “The Amazing Discovery: 1964 Morgan Dollar” by Jack Topping. This week I came across, like many other numismatists, some exciting and slightly confusing news. According to various numismatic news websites, there were reports of a 1964 Morgan Dollar. “There’s no way there was such a thing as a 1964 Morgan Dollar! Maybe this is an error or simple typo” I said. I personally could not believe that it was indeed not a factual error, but the truth. Hidden in the depths of the United States Mint, original hub dies for both a 1964 Morgan Dollar and a 1964 Peace Dollar were waiting to be discovered for 52 years. According to a podcast on Coin Week magazine with expert numismatist Q. David Bowers, there was a small discovery team that found many interesting artifacts at the United States Mint. Q. David Bowers discussed how the hub dies and master dies of both 1964 Morgan and Peace Dollars were easily accessible. Bowers continued to talk about the necessity of silver dollars in the 1960s, as none were officially made since the last official Morgan Dollar in 1921. This find is especially exciting because it is something the numismatic community does not know much about. It leaves plenty of room for speculation, and will continue to keep the numismatic world buzzing for months. Although no specific working dies were confirmed, it is still possible they exist or existed before they were destroyed. According to Bowers, to make a circulating 1964 Morgan Dollar series would require an act of Congress, however the Mint has, and still does today, make trial coins for research purposes. This amazing discovery will continue to be reported on for quite some time, and I look forward to hearing more about it. Classifying Numismatists on Silver: Investors or Collectors? “Classifying Numismatists on Silver: Investors or Collectors?” by Jack Topping. As of today (May 22) the spot price for silver is $16.58 USD per ounce (Source: APMEX). This fluctuating number, always associated with bullion coins, defines the price of this precious metal for investors, specifically those who prefer silver as their commodity of choice. For investors, this is what they need to perform their transactions- they use the spot price to know exactly what they should expect when buying and selling, and to monitor long term growth, should they invest for long periods of time. For collectors of different silver coins, this price can hurt them, as the spot price often puts a limit on the collector. By seeing the spot price of silver, what was a very valuable coin sentimentally could become a low value coin financially. If they’re collecting for posterity, collectors will want to know what the lowest acceptable price is for their silver coins, should future generations need to sell them at the melt value, which also fluctuates depending on the spot price of silver. However, these limitations or expectations of value ultimately depend on the status of the numismatist. Are they a collector, whose goal is to preserve living history through numismatics, or are they an investor, who sees coins solely as a medium for individual wealth? Or are they both, someone who breaks the definition of either investor or collector, someone who wants to both invest for the future financially, and invest in preserving history, for all generations to enjoy? In many ways, it is very hard to classify a numismatist in any of these different types. I for one, would be both an investor and a collector. I collect for history, constantly trying to advance my knowledge of different numismatic subjects, but I also fit the role of an investor- I know that silver coins hold value in virtually any economy. Speaking quite simply, I invest for the future, but I collect for the past. As the reader of this piece, ask yourself where you stand on this topic. Are you an investor, a collector, or both? 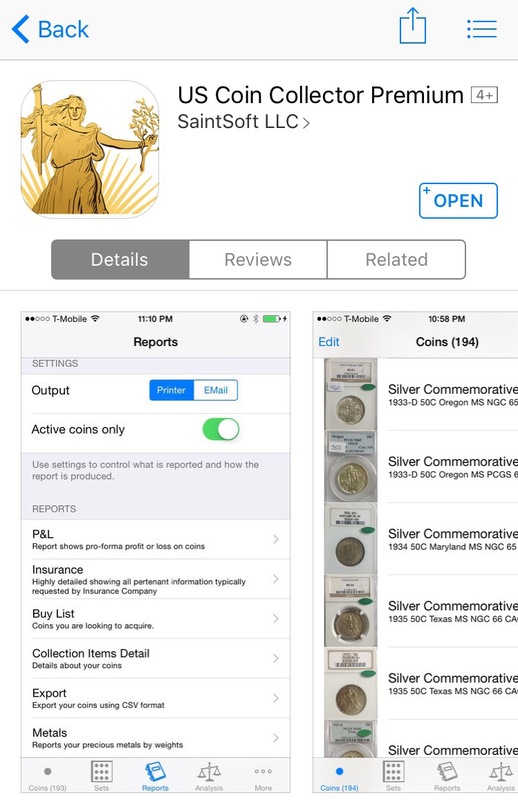 “App Review: US Coin Collector Premium” is an official iOS app review by Jack Topping. This review was completed on an Apple iOS device, for Apple products. All images and other copyrighted material displayed in this review were used with consent from SaintSoft, LLC. 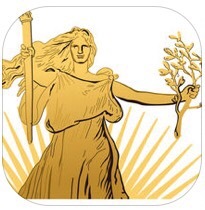 As a return to normal activities since the 2015 holiday season is coming to a close, I wanted to review one of the best numismatic based apps on the Apple App Store: US Coin Collector Premium. The app is by far one of the best coin cataloging and collecting apps on iOS. It allows users to upload and store coins in a neat and organized fashion, and provides a visibly appealing and easy UI. Best of all, there are two versions for any numismatist to choose from: the basic US Coin Collector and the advanced US Coin Collector Premium. Currently, the US Coin Collector app is $0.99 in the App Store, while the US Coin Collector Premium app is $4.99. Today, I’ll be taking a look at the more advanced software for sale, the Premium app. The biggest differences from the Premium app and the basic app include more advanced reports for data analysis and organization, a Touch ID feature for added security (for applicable Apple devices) and a feature to integrate the iOS collection with OS X called the “US Coin” app in the Mac App Store (for OS/X 10.8 or later), priced at $14.99. The app has five (5) pages. These pages, including “Coins”, “Sets”, “Reports”, “Analysis”, and “More” allow for the user to have a well organized collection, easily accessible on their device. To add coins to the app, simply press the “+” symbol in the top right corner to begin. and Sets, should the coin be a member of a set. The “Coin” page in the app also allows the user to put a photo of the coin in, either from the Camera or Photo Library of the device. The app’s “Sets” page is an area to add and view sets for coins. To create a set, open the “Sets” page and choose the “+” symbol, read the instructions, and hit “Begin” to start adding set information. To add a coin to a set, simply open up that entry, go to the “Sets” subsection, and add it to that set. and “Metals” (for a detailed report on the precious metals in the collection, with weight measurements). The “Analysis” page shows different sections, with an “Investment Summary” show total investment and market values to the right of the screen. Below that, it shows different statistics, including the number of Graded coins entered into the app, and the total ounces (oz.) of all coins. The “More” page is full of helpful links, including the support website and email to the developer, as well as advanced features and other references to coin values/news. “US Coin Collector Premium” is a personal favorite. It’s the highest class software for the iOS market, giving users everything they need to organize their collection in one easily accessible place. The Premium app is well worth the $4.99. Click HERE for the basic $0.99 “US Coin Collector” app for iOS. Click HERE for the advanced $4.99 “US Coin Collector Premium” app for iOS.